I’ve had my eye on this recipe for a while, it’s been parked on my Recipes I’d Like To Try (Baking) board on Pinterest. On a Friday night, I tend to bake things that don’t require a tremendous amount of attention; a one-pan item is perfect, especially if it’s going to make the kitchen smell like Christmas. Usually the first time I make something I follow the recipe exactly, but I made some minor changes on the fly this time. The original recipe is here, and it’s simple and straightforward. Dry ingredients, check. 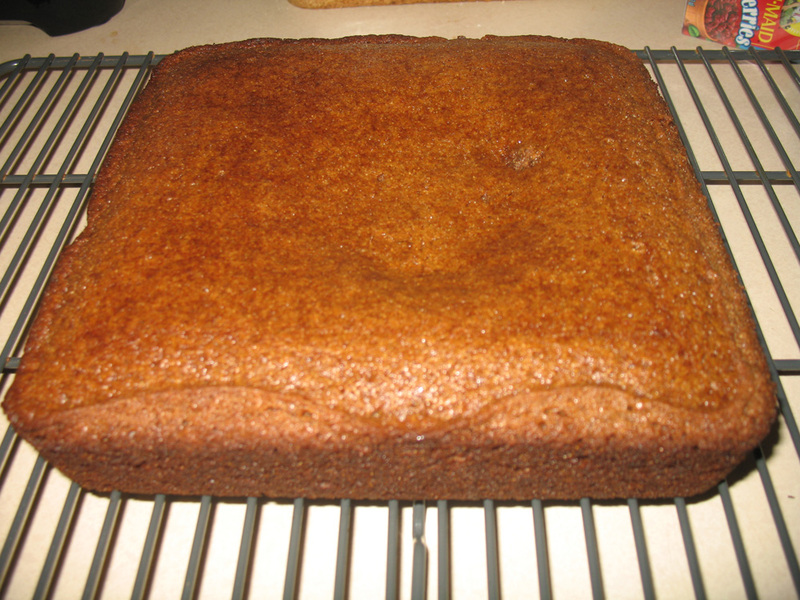 I used whole wheat white flour instead of all-purpose. I doubled the cinnamon, at least, and made it a heaping teaspoon of ginger. 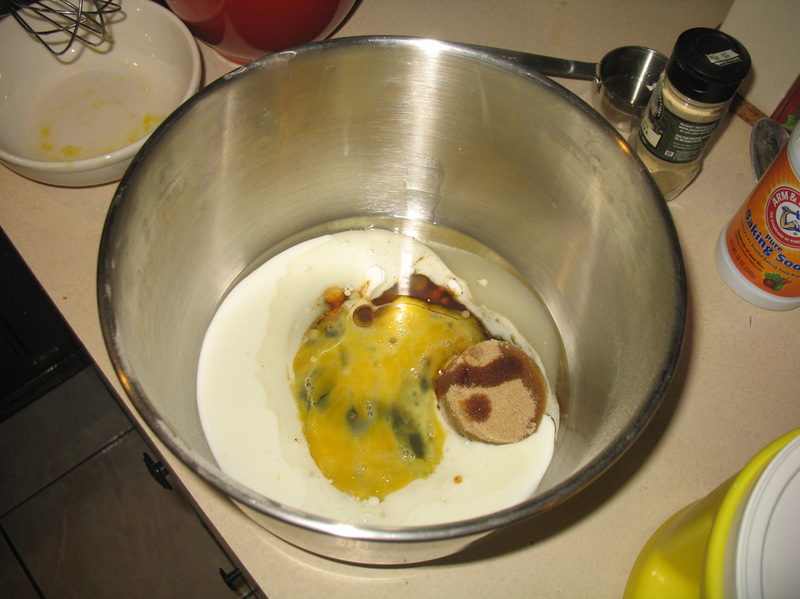 I whisked that together (along with some baking soda) and separately mixed the rest of the ingredients. 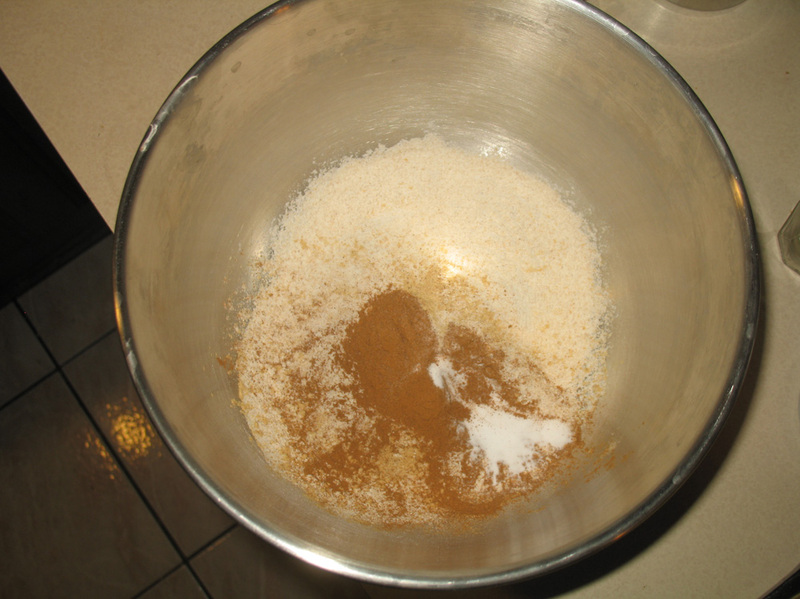 Instead of using a half cup of white sugar, I did a quarter cup white and a quarter cup of brown. Everything else went in according to the recipe: molasses, buttermilk, canola oil, and one egg, which did not end up on my sock. And it started to smell really good. I love molasses. I didn’t even need to use cooking spray on the measuring cup for it because it still had a bit of buttermilk in it, which had the same effect. 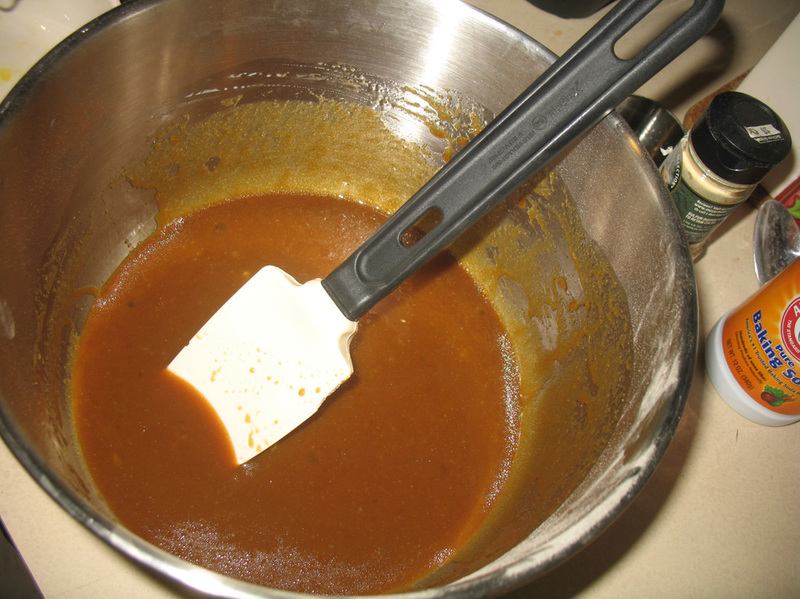 Then I added the dry mixture into that, stirred it up, and poured it into the pan. It said to bake for 25 minutes, but mine took about 30. 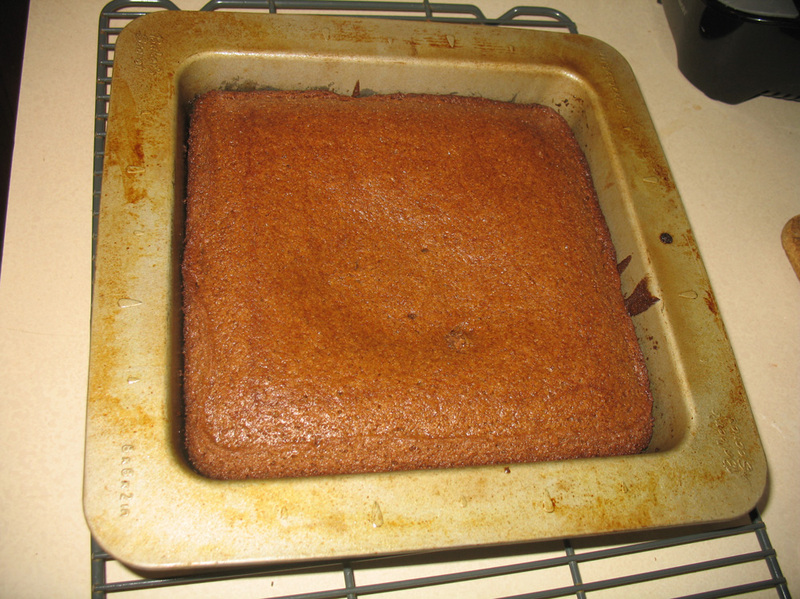 I let it cool for 15 minutes, then flipped it out of the pan. Smelled great, texture was perfect. I think next time I make it, I’ll reduce the sugar. It tastes great but I don’t think it needs quite so much sweetness. 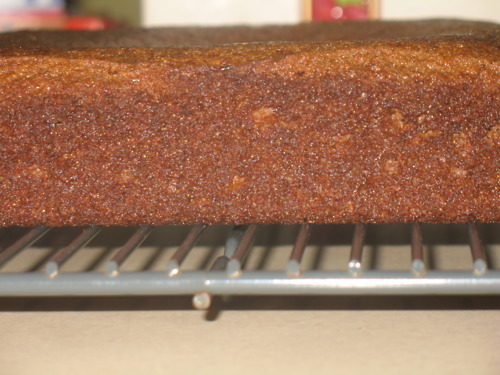 I also might TRY using all purpose flour, just to see if it makes a difference, but I think it’s a great cake and I will definitely make it again. The kids like it too; they had it for breakfast. I had some last night while checking out my NBC screeners. I cheated and watched episodes of 30 Rock I’d already seen, because I love them and I figured they’d go well with gingerbread. They did.